We have all lost people in our lives. Though the primary cause of loss is usually the death of the other person, loosing someone in your life can be caused by geographic distance, the ubiquitous “we grew apart” or reasons of unhealed strife in your relationship. In our busy lives, we often neglect to reflect and remember those we lost. For this reason, I offer the within Sanchin Pilgrimage as a means of remembering those, who for one reason or another are no longer in our lives. That person may be a Sensei, student, training partner, or non-Dojo acquaintance, but, for this week’s Sanchin practice, let us remember them. 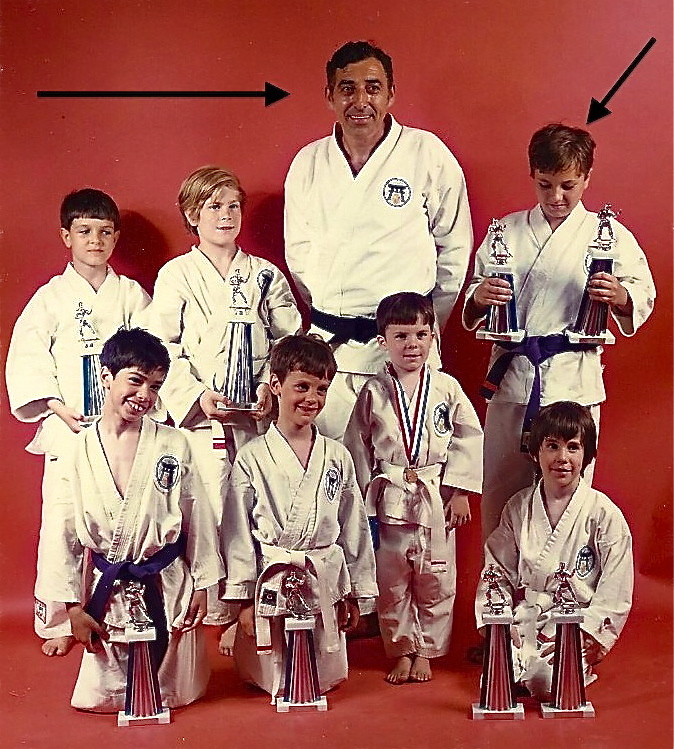 Memories Circa 1974: myself & others with Sensei Nick D’Antuono & my first trophies for kata (Gekisai) & kumite. During your Sanchin, reflect upon and remember some one that you lost in life, embrace their memory and allow them to remain in your life through this experience. The last requirement of this Sanchin Pilgrimage is to remain in an enraptured physical, spiritual and metaphysical state throughout the day by way of the concept of “Zanshin” (the “remaining mind” which is discussed in my Sanchin DVD and Book). As the sun sets a new day, our path for the day winds to an end. The days events will yield to a time of introspection – how was our day, did you grasp the opportunity to walk your own path to the fullest or did you squander the day? Location: outdoors in nature and you should be facing the setting sun. The word “opportunities” in this context does not mean financial or beneficial opportunities. Rather, opportunities refers to you ability to do that which you desire, for example, did you take the opportunity to tell a loved one that you love them, did you hug a family member, call a friend, watch the sunset or sunrise, did you help someone who needed help – or did you simply turn your back on all these opportunities? In essence, did you “live” your day, or did you “exist” during the day? After Sanchin, think of tomorrow as a new day to grasp the opportunities that escaped you today and the new opportunities that will present themselves. Sine quo non provides a restatement of the importance of Sanchin. Thus, it is an excellent platform upon which to base a Sanchin Pilgrimage. The goal of the Sine Quo Non Sanchin Pilgrimage is to acknowledge and appreciate that without the three battles of Sanchin, our lives would not be possible. The three battles of Sanchin to which I refer to are the fundamental battles set forth in my Sanchin book and DVD, to wit: breathing, bodily movement and state-of-mind. Sine quo non also refers to the advanced three battles encompassing our multi-state of existence (See Endnote # 1). You may wish to not only perform the Sanchin Pilgrimage as scheduled, but may also revisit the specific pilgrimage and allow Sanchin to unlock the cage imposed upon your by the drama of daily life. Do this as an integral part of your regular Sanchin practice. 1. A complete discussion of the advanced three battles of Sanchin – the three levels, or states, of multi-existence is contained in my aforementioned book; however, for the novice, these three battles of Sanchin are the physical state, the spiritual state and the metaphysical state. For those familiar with my dissertation on maintaining and synchronizing these three states, you should incorporate same into this Sanchin Pilgrimage. For those not familiar with these states, perform the pilgrimage using the fundamental battles of breathing, bodily movement and state-of-mind. The very last act of the day, under the awe-inspiring night sky, “pray” with Suparunpei (Pechurin) as emblematic of a desire to appreciate the metaphysical aspect of life; the eternal interconnectivity we have with all that surrounds us. This post is a first on two fronts. One is, despite missing last week’ blog, I’ve never before missed my self-imposed deadline for posting a blog. The second (mandated by the first) is that I’ve never posted two Sanchin pilgrimages in a row. My work schedule of late has moved from hectic (working 5 1/2 days) to chaotic (working 6 1/2 days); even so, working is better than not working. The schedule and the press of family events has added additional constraints on my blogging. This situation has been compounded by a general ennui arising from the loss of little Chloe on Valentine’s Day. She will be missed. This Friday, while making my afternoon cup of tea, it occurred to me that my “tea-time” routine would form the basis of a refreshing Sanchin pilgrimage. Each afternoon, around 2:30 pm, I take a slight break to microwave a cup of green tea. I fill my cup half way with filtered water and the other half with aloe vera juice, add a teaspoon of honey and microwave it for two minutes, fifteen seconds to boil the mixture. Rather than stand around and wait, I use this “spare” time to perform either Sanchin Kata, Tensho Kata, or both, as a means of rejuvenating myself for the rest of the work day (which often ends at 7:00 pm). After the kata are finished, the water is boiled and ready for me to add green tea leaves and enjoy. Remember, the group dynamic is not fulfilled by all of us being geographically present, rather, it is fulfilled by each of us performing Sanchin in the proscribed manner. 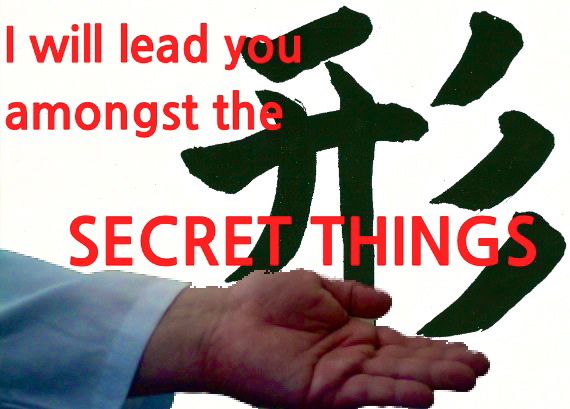 So, we will not only be performing Sanchin (or Tensho for those that learned the kata from the free video), we will also be “sharing a cup of tea or coffee. Once again, this could not be simpler – – use your afternoon coffee or tea break to FIND THE TIME FOR SANCHIN – No excuses should be tolerated – Period. As always, you may wish to not only perform the Sanchin Pilgrimage as scheduled, but may also revisit the specific pilgrimage and allow Sanchin to unlock the cage imposed upon your by the drama of daily life. Do this as an integral part of your regular Sanchin practice. 1. For my martial arts readers that can not “find the time to practice kata” in light of their “busy” schedules, the next time you brew a pot of coffee or cup of tea, why not practice a kata. or two for that matter? Winter. The days are shorter, colder, bleaker. 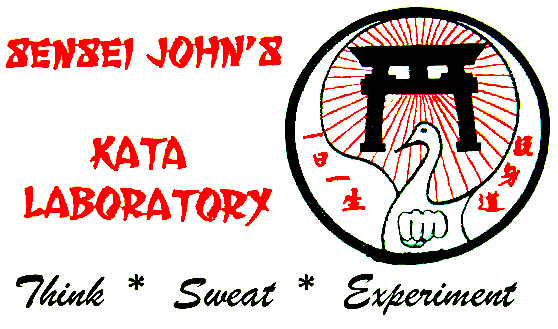 Even with the cold and snow, I am still able to maintain my outdoor Sanchin and kata regime. I will admit; however, that some mornings I am less than inspired to bundle up and venture out to perform kata. Yes, I am only human. As a further source of inspiration, I filmed a recent Sanchin performance in the snow and combined it with several other poems & words of inspiration. Although I emphasize that no special uniform is required to practice Sanchin, the video was filmed with me wearing my gi (karate uniform). 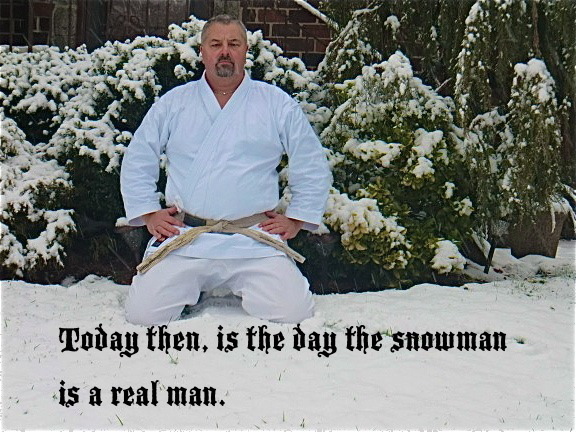 This is because immediately prior to filming the Sanchin, I had filmed various karate kata in the snow for the Goshin-Do Karate blog, WWW.DeFeliceRyu.Com The lack of wearing the appropriate clothing or uniform is NEVER a valid excuse for not performing Sanchin. You are now ready for the pilgrimage. Time: FIRST thing in the morning! Yes, get out of that warm bed and venture out into the cold, crisp air. There is one simple point, just do it and embrace the experience. Once again, you may wish to not only perform the Sanchin Pilgrimage as scheduled, but may also revisit the specific pilgrimage and allow Sanchin to unlock the cage imposed upon your by the drama of daily life. Do this as an integral part of your regular Sanchin practice. To all my readers, please accept my sincerest wishes for a joyous, peaceful, familial Holiday Season. My very best wishes that we may embrace this Holiday with joy and hope as the path of the forthcoming year begins to unfold. So that we may enjoy the Holiday Season together, as a group, on December 26th, 2012 (the day after Christmas) Sanchin Kata shall be performed at 8:00 am, Eastern Standard Time. Adjust your time accordingly, so, for example, I will perform Sanchin at 6 am Mountain Time. Many years ago, I learned from a comrade, Sensei Gil B., that many cultures celebrate not the end of the old year, but, the birth of the New Year. 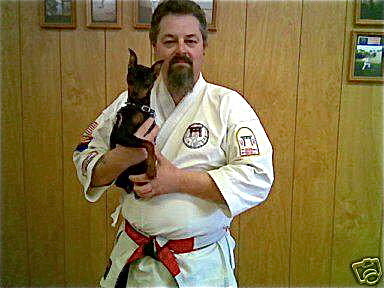 Since then, I have always commemorated the sunrise of the New Year with a Kata training session. In keeping with this tradition, Sanchin Kata shall be performed at 8:00 am Eastern Standard Time on January 1st, 2013. Again, adjust your time accordingly, thus my Sanchin will start at 6 am Mountain Time. I look forward to performing Sanchin Kata with you all.